Now for the remaining swatches of my American Apparel haul. Check here for my thoughts and part one of the haul. Factory Grey is a gorgeous grey. It has slight blue undertones, but nothing that leads it into blue territory. Factory is a pretty good description. It's industrial looking, but still pretty. Loves it. Oh, and yes, that is a little bald spot on my pinky. Just ignore it. I was lazy in the application. Manila, I assume, is so called because resembles a manila envelope, but I don't think there's enough brown in it. I'd say it more resembles a yellow cab or mustard...not the good Dijon-kind, but that yellow deli mustard after it's been sitting out. 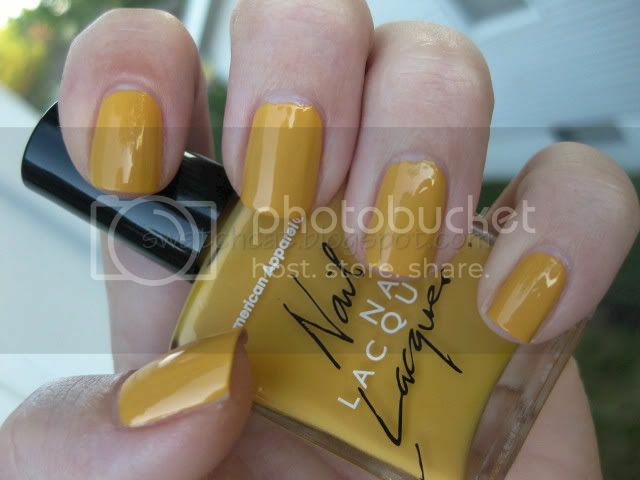 Come to think of it, I'd quite like a Dijon mustard-colored polish. That would be pretty! Anyhoodles, this is a pretty color, but it's not my favorite. I like that it's not one of those in-your-face bright yellows that are everywhere right now. It's a little muted and will carry well into the fall. Rose Bowl is very close to those "grandma pinks". It's a dusty rose color, not terribly unique. The yellow in it kinda gives it a hint of vintage. Not a color I'd wear much...not even sure why I got it. Nonetheless, if you love pinks, you'll probably love this color, and it is very work appropriate. Downtown LA is your basic blood red. The online picture of this was deceiving. I thought it would be darker, a little more vampy, but I guess every line has to have that perfect red. 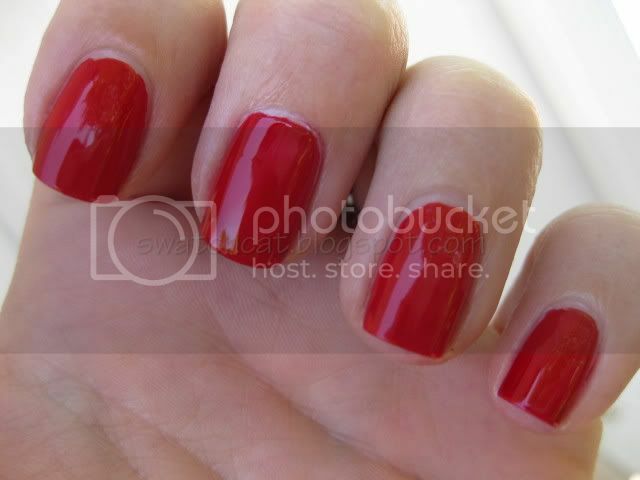 What will truly set this apart from other reds is that it was completely opaque in one coat!! Seriously. I did two out of habit, but there was no need. Also, immediately upon application, I knew it looked familiar. I dug out OPI Vodka & Caviar for a comparison. Sure enough...exact dupe. 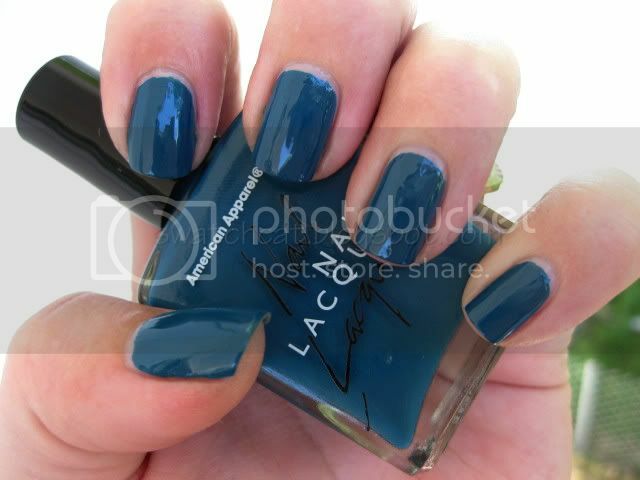 But V&C takes three coats to achieve the same opacity as Downtown LA, plus it's water. If you missed V&C, don't even bother trying to find it. Just get Downtown LA. Oh, and the first pic isn't color-accurate. The comparison pic is much more true to color. Pointer, Ring: American Apparel Downtown LA. Middle, Pinky: OPI Vodka & Caviar. Peacock, well, you can probably guess what color it is...peacock blue. I like that this is another slightly muted color, especially since it's in the blue family because I don't wear blue alot. It's just not my color, but I like my muted blues. Don't get me wrong, it's well saturated with color, but it's just muted enough that it sets itself apart from other peacock blues. I really like this color. Passport Blue. The name puzzles me a bit, because I don't think my passport cover is this dark. This is a deep, dark navy. I'd say more akin to the navy jacket on a Marine Dress Uniform. It's that dark. Nearly black...I love it. Hassid, while it may be a basic black cream, might be one of my favorites. First of all, it was opaque in one coat. Second of all, it's just pure, liquid leather perfection. 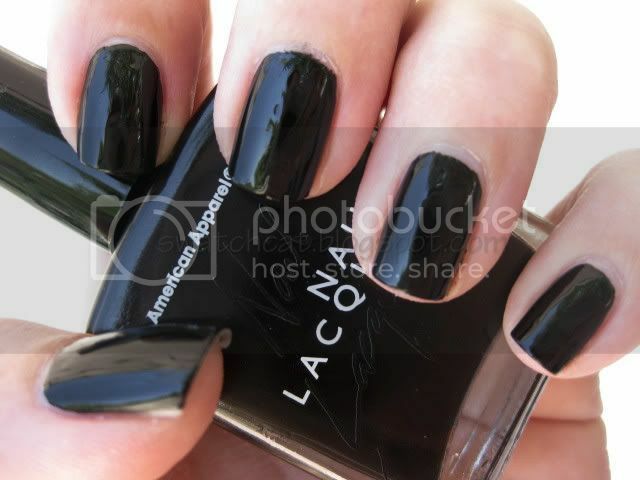 Sans top coat, it has that leather sheen to it, not quite glossy. Add a top coat, and it's shiny patent leather. It brings out my inner goth. Makes me want to go read about vampires and drool over Edward Cullen. 'Scuse me. OMG Manila looks amazing in your photos! I think I need factory grey though. Wow, these n/p are awesome! I think I might have a look at them ;) Thanks for these great swatches!